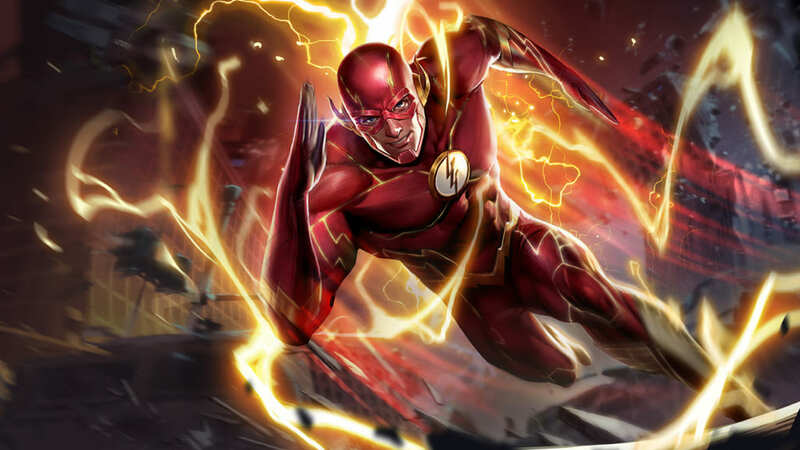 A guide to Arena of Valor's The Flash, the Fastest Man Alive. The Flash is a magic assassin who zips up to enemies before quickly pummelling them with a barrage of fists or a cyclone created by his immense speed. The Flash is a mage/assassin who can rush up on opponents to quickly pick them off. His long-range dash gives him extremely impressive mobility: a fitting strength for The Fastest Man Alive. After rushing in on an opponent with Super Speed he can pummel them with a series of Mach Punches or trap them within a Cyclone of his own making. Mobile – At time of writing, Super Speed has the longest range out of the game’s movement abilities. The Flash will be able to very quickly traverse very long distances without regard to obstacles, very few large enough to impede his movement. This isn’t his only source of speed either, Mach Punch granting a decaying speed boost whenever the last hit connects with a target. High Burst Damage – Each one of The Flash’s abilities, including his passive, can deliver impressive amounts of damage. He perfectly fits the sub-role of an assassin, able to zip up to enemies, quickly destroy them, and then run to safety before his prey’s allies can do anything about it. Untargetable Ultimate – The Flash joins Murad and Zill in the ranks of those who can become untargetable. Players can not attack The Flash while he is channeling Cyclone, nor will any attacks that were aimed at him before hit him. This gives it a large amount of utility, allowing The Flash to dodge large attacks, abilities, or turret fire when he dashes into a dangerous area. Squishy – The Flash’s high damage potential naturally comes at the cost of survivability. While he does have more going for him than other burst assassins, a shield provided by his passive and the above mentioned untargetable nature of Cyclone, but can still be very weak to enemy attacks. This is particularly the case when stunned, all of his defenses unavailable when he is stunned. Short Range – Despite his mobility allowing him to get right up to whomever he wants to engage, The Flash can be limited when trying to deal with ranged heroes. Should he misjudge Super Speed or be caught without it available, he will be unable to do much to retaliate against an opportunistic marksman or mage. The Flash is suited to either the middle lane or the jungle due to his ability to quickly move between lanes to gank. If laning, do your best to dodge enemy harassment while giving out your own. This can be done by dashing up next to the foe, hitting them with Mach Punch, and dashing back. Despite the damaging and harassing potential, don’t spam Super Speed too frequently. It is your main way of escaping enemy ganks. Mach Punch is your main source of damage, anyway, so stick to using that if you need to spam. If laning, take Super Speed at level 1. The utility it offers cannot be missed, even at the very start of the game. Focus on leveling Mach Punch afterward as it will be your main source of damage throughout the match. If jungling, take Mach Punch at level one. It is a much more reliable tool for clearing the jungle waves than Super Speed and you will not likely need the utility of Super Speed right away. Level Cyclone whenever it is available. It has a very high damage potential and offers some nice utility by making The Flash untargetable. Solo Fights: Harass your foe by running up with Super Speed, hit them with Mach Punch and an empowered auto attack and then dashing back to your starting position. If possible, use Super Speed to get behind them when you do, as the pass-through damage will be a nice addition to your burst. When they are low on health, use Cyclone after Mach Punch. The regular damage will chip away what remains of their health before you can hopefully finish them off with the final vacuum. Team Fights: Use Super Speed to get behind enemy lines and attack a squishy target with both Mach Punch and empowered normal attacks. Be careful when returning to your starting position as you do not want to rush right into the enemy front lines. Instead, either keep up the fight to draw tanks toward you so that you can then dash back, or begin an alternate escape route. Use Cyclone either when the enemy team clumps up or things start to get really dicey. The invulnerability and damage it offers is a great way to force the enemy team to choose another target or else get mutilated waiting for your return. Escaping Fights: Your best bet for escape will always be Super Speed. Pass through obstacles as you put distance between you and your enemy to make it even harder for them to catch up. Return to your starting position only if they somehow manage to keep pace with you. After returning, set off in an alternate direction in an attempt to juke your pursuers. Sonicboom – Passive – Every time The Flash moves 4 units, he will receive one stack of speed force. Upon reaching 10 stacks, The Flash will activate the speed force, strengthening his next normal attack while dashing forward. He also temporarily reduces his target’s movement speed by 50% and deals (+1.0 AP) magic damage. When he hits his target, he gains a shield of 350 (+0.5 AP). Move as much as you can in fights to keep gaining stacks. If the enemy is trying to stay still to prevent your charging, casting Super Speed and immediately returning can quickly get you to full stacks. Always be moving in down time, at least when not fully charged. While no character should spend time idle, it is doubly true for The Flash. Super Speed – After a short charge up, The Flash dashes forward, dealing 200/220/240/260/280/300 (+0.4 AP) magic damage to all enemies in his path. The Flash cannot be controlled while dashing and can cancel the dash by using another ability. The Flash gains stacks for Sonicboom while moving with Super Speed. Using it directly after the empowered attack from Sonicboom will lead to Sonicboom being immediately available again. Be careful, as this takes away your main means of escape. The Flash is not invulnerable while moving, so don’t wait too long to escape with Super Speed. You have a bit of time to move around in between casts, so feel free to chase or fight for a moment before returning to The Flash’s original position. When playing against The Flash, take note of the mark that he leaves whenever he uses Super Speed. This is where he will return when he reactivates the ability (and is most vulnerable), so waiting there is a good way to punish him when he over-commits. Mach Punch – The Flash channels the speed force and punches an enemy 5 times within 0.8 seconds, dealing 135/160/185/210/235/260 (+0.2 AP) magic damage every time. The last punch deals double damage and, when it hits an enemy, grants The Flash a 40% movement speed increase that weakens over 2 seconds. Using Mach Punch on minions or monsters can be a good way to close distance on fleeing enemies due to the speed boost that it offers. Cyclone– The Flash takes off in a circle and creates a cyclone, dealing 90/130/170 (+0.12 AP) magic damage to surrounding enemies for 2 seconds. While he is generating the cyclone, The Flash cannot be targeted by abilities and can move the cyclone’s position at 40% of his movement speed. 2 seconds later when The Flash stops, the vacuum from the cyclone pulls in surrounding enemies, dealing 500/750/1000 (+0.7 AP) magic damage. Wait until right next to the enemies to use Cyclone. Using it when they are too far from the center could lead to them simply walking away from the effects. Cyclone makes The Flash a monster at tower diving. Sweep in with Super Speed, attack them with Sonicboom and Mach Punch, and then finish the enemy with Cyclone. Cyclone will prevent the tower from attacking or targeting The Flash, allowing him to safely retreat after the target has died. Keep Super Speed in mind if you are hoping to re-cast after Cyclone. Super Speed has a 5-second re-cast time, so you will need to use Cyclone no more than halfway through if you are hoping to rush back to your original position. Stuns, stuns, stuns. Keeping The Flash from using his abilities is the best thing you can do to keep him vulnerable. Save any movement or defensive abilities you might have for when The Flash uses his ultimate. It has a long cooldown and his lethality will drop considerably when it’s not available. Similarly, if you can engage directly after he uses either Super Speed or Cyclone, The Flash will be much easier to kill. The Flash will benefit from typical magic assassin arcana. An example set would be ten of each Violate, Devour, and Hex. His close proximity to enemies could frighten some who then would want to build some extra durability for the mage. Indomitable, Benevolence, and Valiance sets is a possible set up for such a case. Tanks won’t be too phased by your harassment and have the possibility of disrupting your combo with crowd control. As such, they should generally be avoided unless already engaged with one of your allies. Even then, it is better for The Flash to target squishier damage dealers instead. Warriors can be dealt with when working cautiously. They have more damage than tanks and generally are still rather durable, but will have a rougher time dealing with your damage. In addition, their higher damage comes at the cost of a lower reliance on crowd control, which makes your dives a bit easier to pull off. Again, though, warriors should generally be avoided in favor of squishier enemies. A good assassin can give The Flash a really bad time. Their ability to quickly burst down their targets can keep him from successfully using his abilities and thereby leave him defenseless to their onslaught. The good news for The Flash is that this weakness goes both ways. As such, the winner of an assassin fight will generally be whoever initiated first, so choose your battles. A mage’s danger to The Flash generally lowers as he gets closer to them. If caught at a range, he runs the risk of getting caught by crowd control or a damage nuke. Use Super Speed to get in close and burst through their paper-thin defenses before they have the chance to try. Marksmen will be little problem to The Flash one on one. Their defenses are so low that The Flash will have no problem bursting them to nothing, and their main advantage of range is completely offset by Super Speed. Supports will have a lot of what The Flash hates the most: crowd control. While they aren’t much of a threat on their own, a good support will be sticking close to their allies. A support-marksman pair can be deadly to any hero caught alone, so try to avoid them unless you can guarantee that they are alone or they are involved in a team fight. If Flash uses Super Speed against Aleister’s ” Magic Barrier “, will it get interrupted? Yes, The Flash is not immune to Crowd Control while moving. Makes sense since Super Speed is just like Flash moving normally, except it’s 10x. Also I see what you did on ” they the only boots capable on surviving the friction ” part. How ironic for Glided Grieves surviving Usain/Usian Bolt’s supha speed running while ” Sonic ” Boots is made out of metal. Or maybe they too heavy or they conduct heat too much.